Here we are at the second blog from the Moriond QCD conference and, as promised, I will discuss a bit of physics. First, I have to clarify that there are two weeks of conference, and almost none of the participants follow both. The first one was dedicated to electroweak interactions (Moriond EW), the theory that unifies electromagnetism with the weak nuclear force, responsible for several radioactive decays; the second was devoted to strong interactions (Moriond QCD), the force that keeps quarks inside protons, and protons and neutrons inside the nuclei. In modern accelerators, such as the LHC, both kinds of interactions occur and, nowadays, the topics discussed during the two weeks often overlap. The first day of Moriond QCD was dedicated to the status of the LHC, and to a discussion on the possible "peak" observed in the invariant mass distribution of two photons. Photons, the carriers of the electromagnetic interaction, are very important and familiar particles. They constitute light, the waves that transmit radio, TV and cell phone signals, X-rays etc. They can be produced in the decay of a heavy particle, from the very common neutral pion to the Higgs boson itself. Heavy particles produced in the LHC cannot usually be observed directly, because they decay immediately. However, there is a very important quantity called the “invariant mass” that is conserved in a decay. Based on the direction and energy of the observed photons it is possible to reconstruct their invariant mass, which is the same as the mass of a "parent" particle if they came from a single direct decay. If, on the other hand, the photons do not come from the decay of a heavy particle, but instead from other processes, the invariant mass will not peak at a particular value and will have a smooth distribution. When the Higgs boson was discovered in 2012, the ATLAS and CMS experiments independently observed an excess at around 125 GeV in the invariant mass of photon pairs, above the smooth background due to other processes that did not produce a mass peak. Looking again at the invariant mass distribution of two photons, both ATLAS and CMS now observe another excess – this time with a much higher mass around 750 GeV. All processes in particle physics obey the laws of quantum mechanics, so they are intrinsically probabilistic. It is possible that the modest 750 GeV excess here is simply due to a statistical fluctuation, and the peak is not due to any new particle. Also, since physicists look at a lot of different distributions, in a large range of invariant masses, it is inevitable that some time, somewhere, an excess will be seen just due to fluctuations. A very important component of each analysis searching for new physics is the statistical estimation of the probability that an observation is due to fluctuations, or to not-understood detector effects. The probability that this 750 GeV peak is coming from such a fluctuation is of the order of 1% – so still relatively high – and the only way to know more is to wait for data from the LHC. If the peak was a fluctuation in 2015 data and no new physics is present, the new data will show no peak at 750 GeV. The hype will disappear together with the “bump”, as has already happened many times. In the meantime, the community is discussing what this object could be if confirmed by this year's data. Since it decays into two photons, like the Higgs, why can't it be another Higgs boson? Some theories can allow for up to five of them! On the other hand, the Higgs tends to decay to the heaviest particle it can – so a heavy Higgs with a mass of 750 GeV would decay into a pair of top quarks (each with a mass of about 175 GeV). But no excess top pair production has been observed. Let’s wait and see. Unfortunately, in my career, I have seen many possible new signals that ended up just being statistical fluctuations. But, clearly, this modest result is something that the community will be watching very carefully over the next few months. 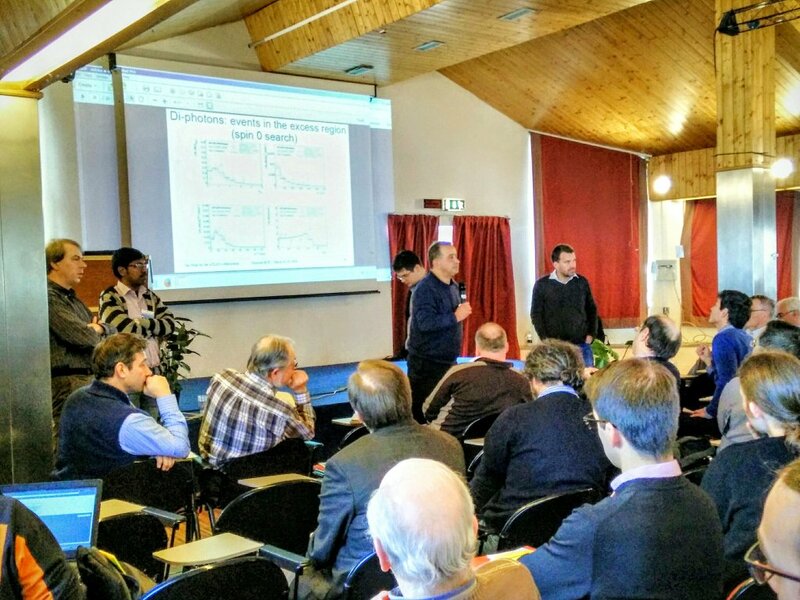 Later sessions were dedicated to the latest results on top quark properties, and to the search for new phenomena. A large fraction of the LHC physicists are currently looking for an indication of the existence of particles or interactions not predicted by the standard model. Some of these searches specifically target signatures of a given theory, others are just looking for anomalies with respect to the predictions in a given final state (like the photon invariant mass study I discussed above). In the hundreds of analyses performed to search for new physics, no significant deviation from the current theory has been observed so far. Negative results are not as bad as they may sound, since they allow us to restrict the allowed parameter space of proposed theories, and even to rule out completely some theories, as incompatible with the experimental evidence. This is one of the ways science advances, and it is by far more common than discoveries.